The unique collections held in special collections libraries attract researchers from all over the map, no matter if the map is local, national, or global. Those of us who work in special collections have always known this, and we frequently jabber about it to anyone who will listen. But we can’t often show it. 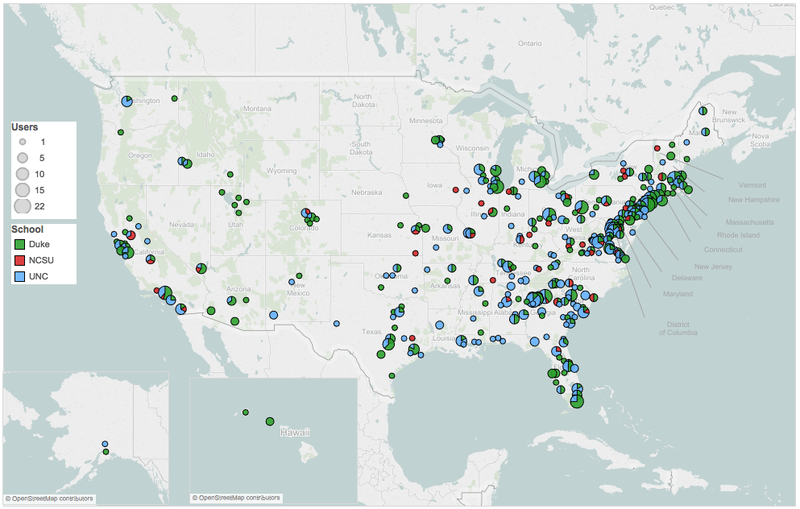 Recently, library staff at Duke’s Rubenstein Library, UNC Chapel Hill’s Wilson Library, and NCSU’s Special Collections Research Center combined the data we’ve collected in order to create some maps showing the home cities, states, and countries of our users from calendar year 2013. Special collections staff gathered this data, but it was Duke’s terrific data visualization coordinator Angela Zoss who used Tableau to create these excellent maps for us. Thanks Angela! The data we gathered shows onsite users of the Duke and UNC Chapel Hill special collections libraries. That is, the blue and green shown on the maps represent researchers who visited our reading rooms to use our collections in-house. The red shown on the maps shows something slightly different – both onsite users and users who made use of NCSU collections remotely (through email reference, etc.). The US map makes clear what we all probably suspected – that most of our researchers come from east of the Mississippi and are clustered in the Northeast. Only Duke shows researchers from Utah, and this doesn’t surprise us. Duke holds two copies of the first edition of the Book of Mormon, and many visitors come to Duke each year to see them (the two copies were used a total of 33 times this past year). The global map shows that each of us – NCSU, UNC Chapel Hill, and Duke – had researchers from Canada, the UK, and Japan. UNC Chapel Hill welcomed visitors from China and Japan. Many international researchers came to Duke to use collections such as our economists’ papers. But only NCSU had a user from Bosnia-Herzegovinia! While we’ve only just begun to share our data with each other, this mapping project demonstrates that, taken together, the special collections libraries at NCSU, UNC Chapel Hill, and Duke have truly global reach and impact. Our collections are diverse and exciting, and the world knows it! When most people think of maps and books they immediately imagine maps, or atlases. Yet maps illustrate and contribute to a larger argument in books of all kinds, including histories, geographies, travel accounts, and novels. 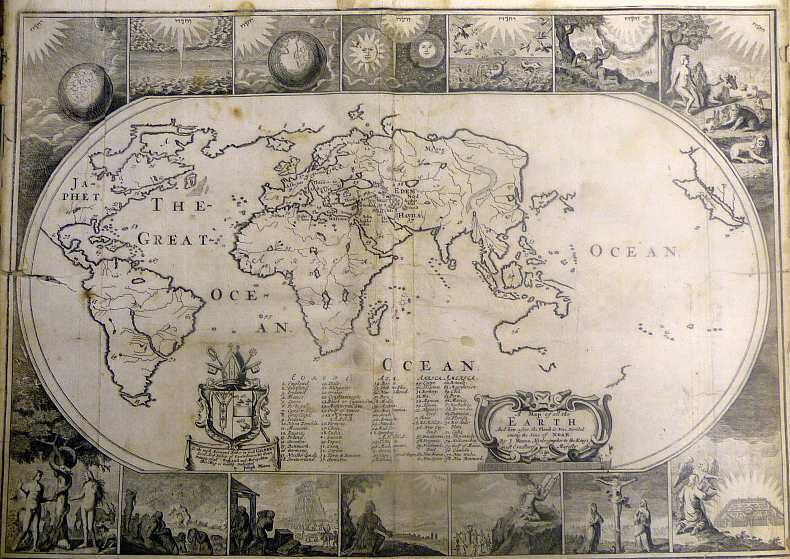 Beyond atlases, maps are often studied or collected as individual items, or “sovereign” maps, in the words of French scholar Christian Jacob. 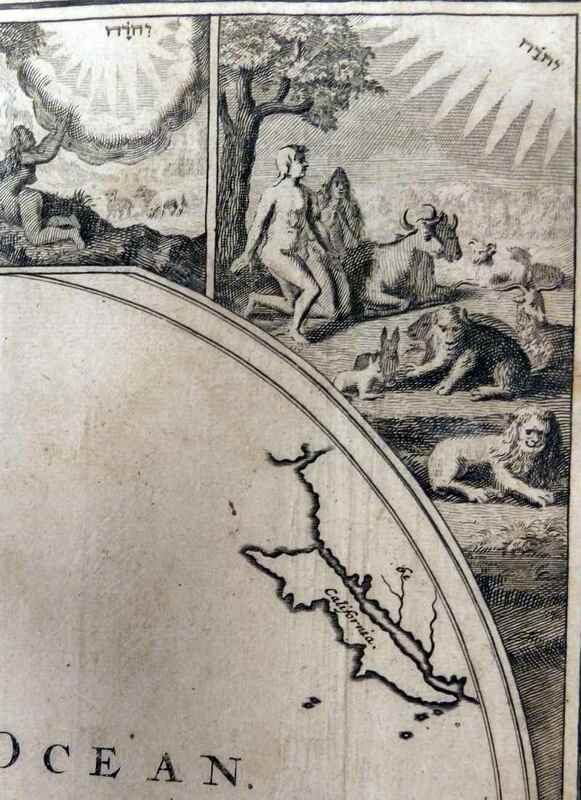 This discussion dethrones the sovereign map, asking what changes theoretically and curatorially when we think about maps as “bound images” and a graphic part of the story told by authors and printers in book form. 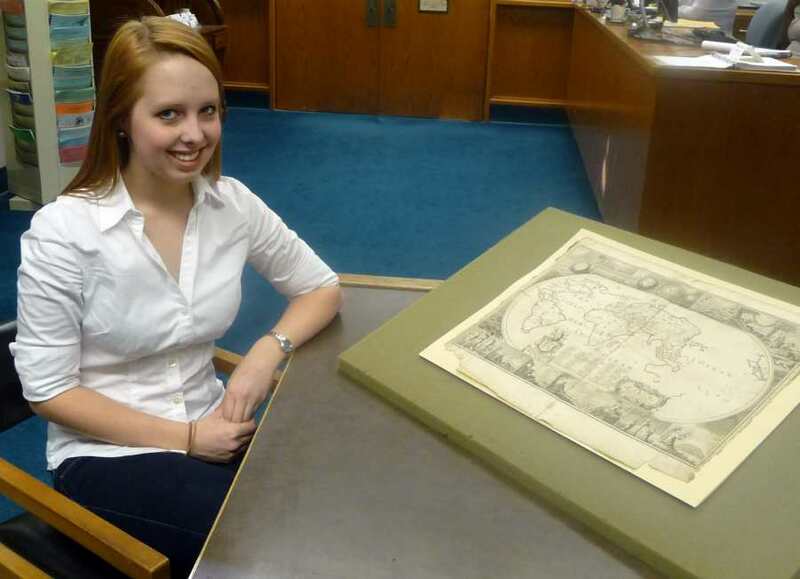 A range of bound cartographic materials from the Rubenstein Library’s collections will be on display. For more information, see here on the BorderWork(s) Lab website. Sponsored by the BorderWork(s) Lab at the Franklin Humanities Institute and Humanities Writ Large. We’re celebrating the beginning of a new fiscal year with a week’s worth of new acquisitions from the first half of 2012. Two newly acquired selections have been featured in a post every day this week. All of these amazing resources are available for today’s scholars, and for future generations of researchers in the Rubenstein Library! Livio Sanuto, Geografia: This work, published in 1588 in Venice, is the first edition of the first printed atlas of Africa. 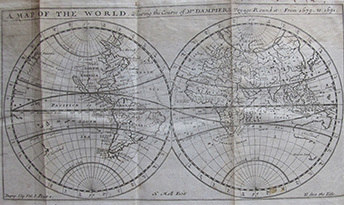 It contains twelve double-page engraved maps showing the continent; for its date, the maps are surprisingly detailed and accurate, correcting many of the earlier errors in French and German maps. Nevertheless, Sanuto also kept many preconceived European notions about Africa, and introduced new errors in the text of the atlas, making the work a fascinating case study of European views of Africa in the sixteenth century. The work is foundational for the study of European depictions of Africa, and will be a cornerstone for African collections in the John Hope Franklin Research Center for African and African-American History and Culture. 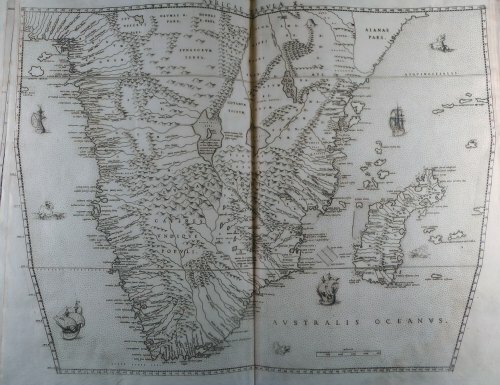 Map of southern Africa, from Livio Sanuto, Geografia (1588). Ezekiel Skinner Papers: Ezekiel Skinner (1777-1855) was a missionary and physician who worked in Monrovia, Liberia for the American Colonization Society during the 1830s. Although almost 60 years old, Skinner believed it was his duty to continue the work of his son, Benjamin Rush Skinner (named for the famous physician Benjamin Rush, under whom Ezekiel had studied), who had died in Liberia a few years before. The papers contain correspondence and other documents written by Dr. Skinner during his time in Liberia, including a description of a “slave factory” and other details of the slave trade, and discussion of medical treatment of Liberian colonists, including treatment of a fellow doctor, the African-American Charles Webb. The Skinner papers enrich the collections of both the John Hope Franklin Research Center and the History of Medicine Collections.